Reliable Wireless Sensor Networks - Extreme Telematics Corp.
Wireless sensor networks are becoming more common in the oilfield than ever before. Adoption of short range wireless networks has been much slower in oil and gas than in other industries, simply because the technology has historically been unreliable. Batteries would not hold up, and the communication link was not reliable enough for real time systems. On top of that, radios were not certified for use in hazardous location and were typically too expensive to justify their use. Most of these problems have now been eliminated or mitigated enough to be relied on for everyday monitoring applications such as reading pressures, tank levels, plunger arrivals, and more. This provides a lot of flexibility as it eliminates the cost of lengthy runs of cable, allows signals to more easily cross from one hazardous zone to another, and eliminates the need for numerous physical inputs. 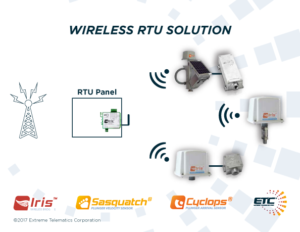 The Iris Wireless Bridge nodes are certified as Class 1 Div 1 and connect to a wide variety of inputs including discrete switches, analog transducers, Modbus, HART, turbines, and RTDs. All of the nodes connect back to a single gateway that can pass two discrete signals back and/or make all the remote sensor readings available through the Modbus interface. The replaceable battery in the remote node is not only able to power the internal radio, but is also capable of intermittently powering a pressure transducer for 7 years, or continuously powering a Cyclops Plunger Arrival Sensor for 3 years. Using the solar power option, a Sasquatch Plunger Velocity Sensor or Cyclops can be powered perpetually. Combined with a range of ½ mile and a temperature range of -40°C to + 60°C, reliable, long last communication has been achieved. With a more robust, reliable, and long lasting communication link, wireless sensor networks are rapidly replacing wires throughout the oilfield, and are the preferred choice for operators North America wide. Get in touch with us for more information on ETC’s wireless network solution!